that back seat is pretty crazy! Call her crazy. Call her a Portland stereotype—although she claims she doesn’t do it to save the world—“I cancel out my bike riding every day with all the other terrible things I do,” she admits. “I don’t compost, I stink at vegetable gardening”. 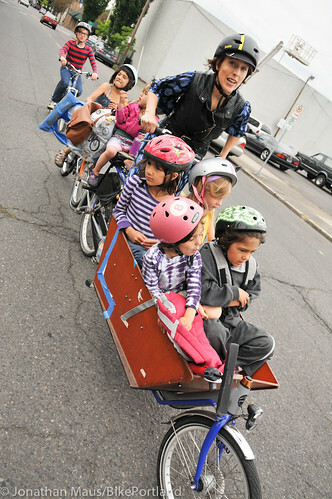 But, Emily (34) traded in her SUV for a bakfiets (a traditional Dutch cargo tricycle) to haul her brood of six (ages 2 to 11). In three years, Emily estimates she’s spent about $135 dollars maintaining her bike. Yes! And they are all wearing their helmets. Isn’t is soooo cute?! Support The World Wildlife Foundation! Say NOPE to extinction! What it takes to make a quarter-pound hamburger. I need to stop eating. A self-sufficient home located on a sheep farm atop a hill. Would Greece Leaving The Eurozone Make Greek Yogurt Cheaper? A listener asks and we answer. Want to know more about what @VFAFellows do? Watch here! Duolingo is our latest investment at Union Square Ventures. Also check out Brad’s blog post on why we invested.